The resident Partner in Cramer & Anderson’s Washington Depot office, Attorney Robert L. Fisher, Jr. focuses primarily on Residential & Commercial Real Estate Law, including litigation involving real estate, along with Planning & Zoning Land Use law, and land-use and environmental matters. Estate Planning and administration is another key practice area for Attorney Fisher. Attorney Fisher has long and varied experience in representing clients on Planning, Zoning and Inland Wetlands issues and appeals, and he appears regularly before land-use commissions in Litchfield County. Additionally, Attorney Fisher is part of a team of attorneys with experience in all aspects of land-use law, including working with developers on applications for subdivision, site plan, and special exception approval, which often involves calling on the firm’s network of surveyors, soil scientists, civil engineers and other professionals. In handling litigation involving real estate and land use, Attorney Fisher deals with such issues as boundary line disputes, use of property issues and environmental matters. Attorney Fisher’s practice also includes representation of purchasers, sellers, and financial institutions in residential and commercial real estate transactions, from simple to complex. In the arena of Estate Planning, Probate & Trust Administration, Attorney Fisher is experienced in creating and administering trusts, and in drafting wills and living wills, durable Power of Attorney documents, health care directives and other related planning tools. While helping clients in what can be an emotionally challenging time, Attorney Fisher focuses on the protection and preservation of assets, asset management, and planning that covers the whole spectrum of issues that families are facing. 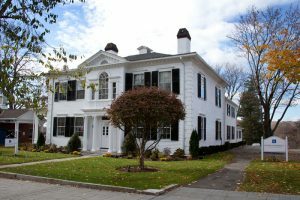 Attorney Fisher joined the Litchfield office of Cramer & Anderson after graduating from the University of Connecticut School of Law in 1976 and became a partner five years later. He graduated from Princeton University in 1972 after serving as an officer in the United States Army. Early in his 40 years of practice, he worked on a variety of criminal defense matters and civil litigation, including family law. Attorney Fisher has served as a volunteer on numerous community boards and agencies, and has been Director of Connecticut Attorneys’ Title Insurance Company since 1997. He is a Justice of the Peace and resides in Goshen. Rebecca Bligh works as an administrative assistant for Attorney Fisher in the Washington Depot office. Her email address is rbligh@cramer-anderson.com, and her telephone number is 860-868-0527 . When Your Tree Falls On Your Neighbor’s Property, Who Is Liable For Damages?